Preliminary results of an audit commissioned by the Arizona Republican Party concluded that Maricopa County’s Democratic recorder didn’t violate any laws during the 2018 general election and that two disputed policies he implemented didn’t affect the outcomes of any races. Attorney Stephen Richer, who is conducting the audit, was unable to substantiate several other claims, some of which did not cite a source for allegations, that Maricopa County Recorder Adrian Fontes acted inappropriately and manipulated the election process to favor Democrats. Richer wrote that he is still awaiting records from the Maricopa County Recorder’s Office, and emphasized that the findings are not final. Richer wrote that then-AZGOP Chairman Jonathan Lines commissioned the audit in November 2018 in response to Republican concerns about the party’s November losses, which came after Democrats took the lead in several statewide races in the days after Election Day. Richer works for the law firm Steptoe and Johnson, but conducted the audit as a volunteer, not as an employee of his firm. The audit focused on four issues: Fontes’s expansion of pre-election emergency voting, his decision to verify or “cure” early ballots that had problematic signatures after the polls closed on Election Day, allegations of partisanship against Fontes, and several unsubstantiated election fraud allegations. Richer wrote that Fontes’s policies on emergency voting and ballot curing deviated from those of his predecessor, Republican Helen Purcell. Early in-person voting in Arizona ends at 5 p.m. on the Friday before an election. But state law allows for after that deadline for people who have emergencies that would keep them from the polls on Election Day. Under Purcell, who served as recorder for 28 years before Fontes defeated her in 2016, Maricopa County offered emergency voting, but only at the county recorder’s office, and sought to restrict it to people who had genuine emergencies that would keep them from voting in person on Election Day. Purcell told Richer that she once rejected then-Congressman J.D. Hayworth’s request to use emergency voting on the grounds that he would be in Washington, D.C., on Election Day because he’d known that in advance and hadn’t planned for it. Fontes opened five emergency centers for the August primary election and again for the general election, and publicly encouraged people to use them. He said it wasn’t his place to question voters on the nature of their emergency, and that he wanted to allow as many people as possible to vote. Republicans have questioned Fontes’s decision to expand emergency voting and noted that the early voting sites were primarily in Democratic areas. In one instance, he opened a center in the heavily Democratic town of Tolleson at the request of county Supervisor Steve Gallardo and Mayor Anna Tovar, both Democrats, though another center was already slated to open just a few miles away in Avondale. Richer’s audit concluded that Fontes didn’t violate the law in his use of emergency voting, though he acted “in a manner inconsistent with the intent” of state law and said it’s “plausible” that he acted with partisan motivations. “[I]t could be convincingly argued that this is an inappropriate departure from the meaning of emergency as codified in Arizona statutes and as intended by the enacting legislature. However, the statute defining emergency is broad, and neither the state nor the 2014 Elections Procedures Manual requires that Recorders take specific steps to ascertain the voter’s emergency,” Richer wrote. When county election officials receive early ballots, they compare voters’ signatures on the envelopes to the signatures they have on file to verify the voters’ identities. When there’s a possible mismatch, they reach out to the voter in question. But most counties stopped trying to “cure” ballots with problematic signatures on Election Day. Fontes decided to continue curing ballots after Election Day in response to a lawsuit threat from several civil and voting rights groups. Lines initially claimed the practice was illegal and threatened to sue any county that adopted it, though the AZGOP later changed its position and urged all counties to cure ballots past Election Day. In the preliminary audit report, Richer wrote that, like with emergency voting, Fontes departed from Purcell’s policies on ballot curing by extending the process past Election Day, and even argues that the extended process “seems incompatible” with a state law on challenges to early ballots. But Richer found that Fontes did not violate Arizona statute or the state’s 2014 election procedures manual, which is the last one implemented by the Arizona Secretary of State’s Office. Richer also noted that neither emergency voting nor ballot curing resulted in enough votes to have tilted the balance in the races for U.S. Senate, secretary of state, superintendent of public instruction or Corporation Commission, all of which saw Democrats overcome Election Night deficits and take the lead as counties continued counting ballots in the ensuing days. Maricopa County saved nearly 7,000 ballots through its curing policy, while nearly 3,000 votes were cast in the county at emergency voting centers. The smallest margin of victory for any of those Democratic victors was by Katie Hobbs, who defeated Republican Steve Gaynor by about 20,000 votes in the race for secretary state. Richer emphasized that his findings are only preliminary and said he is still waiting for the Maricopa County Recorder’s Office to fulfill several public records requests. Those requests, submitted by Richer and AZGOP counsel Kory Langhofer, sought various records about emergency voting and other election-related issues. One request seeks any communications between Fontes’s office and Democratic megadonors George Soros and Tom Steyer. It is unclear what led the AZGOP to believe there may have been communications with Steyer and Soros, the latter of whom is the subject of many baseless conspiracy theories in conservative circles. Fontes said the report showed that he’s following through on his campaign pledges of sharing more information with voters and getting more people’s ballots validated. “I feel vindicated that my campaign promises have been met,” he said. Fontes noted that the AZGOP initially threatened to sue him over his ballot curing policy, only to later support that same policy and urge a judge to implement it in all 15 Arizona counties. Every county adopted that policy for the 2018 general election as part of a settlement over a Republican-led lawsuit. “I’m super excited that they admit that the Republican Party adopted my policy for validating signatures,” Fontes said. In the audit report, Richer also aired several conspiracy theories about Fontes without providing any evidence, labeling the allegations as unsubstantiated. He wrote that Fontes has been accused of coordinating with Democratic U.S. Sen. Kyrsten Sinema’s campaign by providing information about emergency voting locations before they were announced to the public; of sending “helpful private text messages” to an attorney representing the Arizona Democratic Party instructing her to sue his office to get records she sought; and that he “helped place people” with a campaign firm that assisted the Arizona Democratic Party. 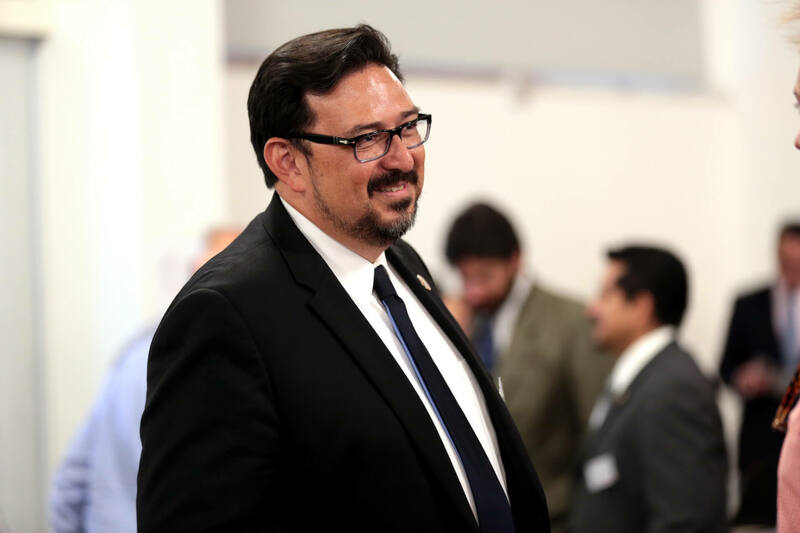 Fontes denied providing advance information to Sinema’s campaign, and said he’d never heard of the campaign firm Zero Week Solutions. Fontes said he informed attorney Roopali Desai that records she sought for the Arizona Democratic Party were not releasable by law, and that the only way she could obtain them would be through a lawsuit. Richer wrote that Fontes didn’t provide similar information to the AZGOP or to Republican U.S. Senate candidate Martha McSally’s campaign, which Fontes said was because they didn’t actually ask for it. “Of course, it doesn’t say that,” Fontes said. One allegation in the audit doesn’t appear to have anything to do with Fontes or the recorder’s office, and it’s unclear why it was included. A woman who is a registered Republican claimed in a signed affidavit that two people came to her Tempe home and asked if she would help them elect Democrats by rooting through trash bins for discarded ballots that would then be filled out for Democratic candidates and put in the mail. Richer said he “appreciates” that Fontes acknowledged he didn’t jump hastily to any conclusions in the audit, but said the findings raised red flags. “I think the average reader of the report will see that there’s more than a little bit of evidence in the report, and it raises some serious questions that merit answers,” Richer told the Mirror. Richer said the audit would “undoubtedly benefit” from the fulfillment of his the numerous public records requests to the Maricopa County Recorder’s Office, or from Fontes agreeing to an interview. Fontes said the records Richer seeks won’t change any of the conclusions and said there’s no reason he should “validate” the audit by agreeing to be interviewed, saying there’s no basis for the audit in the first place. The audit’s findings are intended to be only preliminary, but its future isn’t assured due to a leadership change at the AZGOP. On Jan. 26, former state senator and two-time U.S. Senate candidate Kelli Ward, a conservative firebrand, ousted Lines, who initiated the audit. Zachery Henry, a spokesman for Ward, said the new party chairwoman would look at the pros and cons to determine whether the audit should continue. He noted that one of her top priorities during her campaign to unseat Lines was election integrity.